To end poverty, we must change the way poverty is addressed in our country. That’s why we focus on engaging key leaders and groups with our mission. Our goal is to influence thousands of decision makers, policy makers, thought leaders, educators, corporations and more to join us in this fight against poverty. We do this by exporting our solutions, having others to our campus to learn about what we’re doing, and testifying on public policy issues — which is how we met Speaker Ryan. Our CEO Heather Reynolds first testified in front of Paul Ryan at a hearing of the House Budget Committee and again the following year to the Ways and Means Committee. Both testimonies focused on the importance of case management and the flaws of the social services system. Speaker Ryan later stated that he had previously been wrong about poverty. We were inspired by this willingness to challenge his previously held notions about the poor and penned an open letter in response. Speaker Ryan’s decision to visit our campus to learn more about our work gave us the opportunity to go deeper on many of the issues plaguing the way poverty is currently addressed. So, What Did We Have To Say? We expressed our concerns and suggestions for the safety net. We believe in the safety net. But we also see its problems. The current system is a complicated, overly bureaucratic mess that is difficult to navigate and access. Uncoordinated structures and outdated regulations limit service providers’ ability to organize programs based on actual client needs. Funding restrictions often limit the ability of non-profits to be as effective as they could be with more flexibility. Our client Dominique gave an example of these issues at a roundtable discussion. CCFW client Dominique tells Speaker Ryan her experience navigating the system as the mother of a child with autism. The benefit cliff keeps people trapped. Income and asset limitations prevent people from successfully moving out of poverty long-term. An individual or family may begin earning enough income to lose their benefit support, but many times the income increase is negligible when compared to the loss of the benefits. How is a family supposed to move forward when a $2 raise can actually reduce their overall income? We have a habit of thinking we know what’s best for those struggling in poverty. This habit leads to a system running on auto-pilot that assumes it knows the answer to a question it never stopped to ask. We talk a lot about holding those receiving services accountable, but don’t apply that same level of scrutiny to the services we’re providing. Everyone’s poverty looks different. Prescribed programs neglect the unique circumstances of the individual. Our clients are the experts on their own lives. Hindering a client from taking control of their life keeps them boxed in by the parameters set forth by this “one-size-fits-all” approach. This was the case for our client Chris. Chris had a dream of being a nurse, but couldn’t access services because of his work experience. Watch his story below. 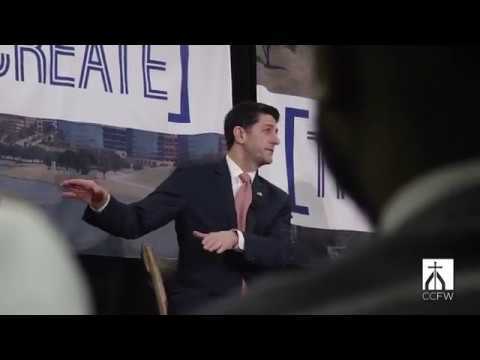 Catholic Charities Fort Worth client, Chris Menasco shares his story with Speaker Paul Ryan. What did Speaker Ryan have to say? You can watch our townhall with Speaker Ryan below! We will continue as we always have to make the most of any and every opportunity we have to influence and challenge the way poverty is addressed in our community and our country. Want to join us? We’d love to have you attend a KNOW Poverty Hour — a dynamic one hour tour of our mission in action.